Single Hung Windows are a type of window that has two sashes. One is movable while the other one is fixed. Usually, the bottom sash is the one that can be moved vertically and facilitates air flow for better ventilation. The fixed part serves to insulate the home from noises from the outside. This type of window is simple and is a traditional pick for adorning new and old houses. It is made of materials like wood, vinyl and aluminum. It comes in different styles that fit your needs, and it is easy on your budget. Single hung windows have been used for centuries. They are found in wooden frames of homes build even before 1960. 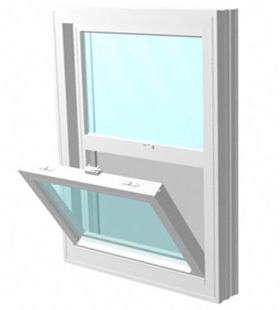 Considered as traditional and classic, the features of this type of window have been adapted in recent times. Modern versions use wood and vinyl and low energy types of double panes. Single hung windows are the top choice of people who prefer less-expensive windows that deliver the same advantages as the expensive types. With fewer construction components, they are simple and easy to set up and maintain. Homes with little room for sashes that open in and out are ideal to use the single hung type. It is a good choice so that no space is used on the home’s exterior like walkways. It is also energy efficient. In choosing the single hung windows, go for the materials that provide long-term durability, less water and air leaks, better energy efficiency and more convenience. There are removable sashes to make cleaning and maintenance easier. There are sashes that can be tilted or slide more smoothly. There are models that keep locks hidden for better security and aesthetic impact. For more quality assurance, check the efficiency ratings of the windows. These ratings include the U-factor for the ability to conduct heat and the R-value for insulation. A good window has less U-factor and high R-value. Other indicators to consider are the solar heat gain coefficient (SHGC) and the visible transmittance (VT) that measure the amount of sunlight that passes through the window as heat and as light, respectively. Lower SHGC and higher VT ratings are better. Another major consideration is the choice of a window installer. Top manufacturers certify the installers that they have trained to provide quality services. Installers recommended by window manufacturers and those that are certified by the American Window & Door Institute are the best choice. Always check the manufacturer’s instructions to avoid violating the warranty provisions. How Much Do Single Hung Windows Cost? As always the size and window materials used will vary the price. A basic single hung window can be purchased for around $150 dollars and can cost between $200 to $275 dollars when including the installation fee on average. Vinyl frames are popular choice used in single hung windows as the vinyl frames are normally less expensive than wood and aluminum. A lower end aluminum frame or vinyl frame in the mid-range is about $200 to $300 dollars. The price including installation will run around $275 to $450 dollars on average. The framing materials of a premium window are usually made of aluminum or wood. High end ranges the cost of single hung windows range from $350 to $500 dollars for each window and $450 to $750 dollars installed on average. See How Much You Can Save On Single Hung Windows Today! Prices of casement windows differ according to type, color, size, and features. Thus, it is necessary to compare the prices of various window brands and to put products side by side in order to see the pros and cons. Therefore, the price of the end product you will get is dependent on your careful selection and inspection.